I know who you are… You’re just trying to “get by” to “get through” the obstacles of your life. You always put others needs before yours and there’s nothing life for you at the end of the day. You beat yourself up and blame yourself for all the things that aren’t going right life. 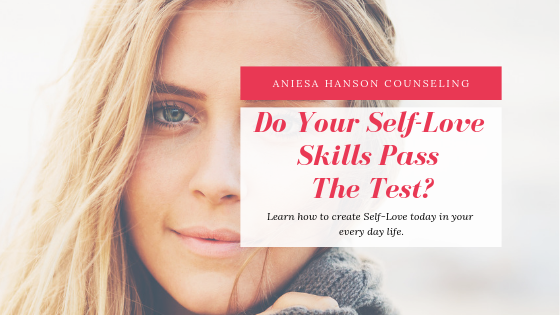 So… do your self-Love skills pass the test? You probably feel like you’re dealing “well enough” and somehow, by the grace of the gods, you get to the end of the day just to repeat it all over again in the morning. Is this what adult life is supposed to look like? Just “getting through” the day feeling miserable and depleted?? This is something I see EVERY DAY in my counseling practice in Tampa, FL. You’re not alone! Let me share a little about me…. I survived for years by just “getting by”. I didn’t even know that life could be any different. For more about my own personal growth journey CLICK HERE. The first time I heard the term ‘self-love’ I was confused. I thought the concept of “self-love” was what lucky people experienced because they didn’t have real problems in their life. I was wrong. Self-love is formed by your thoughts, relationships and experiences. When you have healthy self-love, you like yourself and see yourself as deserving of unconditional love and respect. When you don’t practice self-love, you put little value on your opinions, needs, and ideas. This means what you’re doing now doesn’t have to be permanent. You can change it! Through gaining my own self-knowledge and directly working with mental health experts, I broke free of my blocks around self-love. These blocks kept me in denial believing that “getting by” was good enough. After doing this work, I quickly gained control of the obstacles of my life while also developing REAL kindness, patience, and understanding for MYSELF. Did this happen because all my obstacles in life went away? Hell no! This was because I actively changed my perspective. I’m living proof that just “getting by” shouldn’t be your norm. You don’t have to sacrifice your own needs, wants, and happiness for others. Stop selling yourself short. You have a whole beautiful fulfilled life ahead of you and you need YOU to truly accept and love yourself to enjoy it. When you choose to transform your life, you choose to transform everything around you. If you’re ready to make a shift like I did, CLICK HERE to schedule your FREE 15 Minute Phone Consultation today.